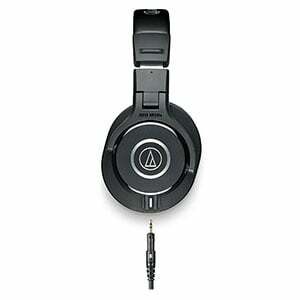 Audio Technica’s ATH M Series of headphones has really rocked the industry when they first appeared. Needless to say, ATH-M40x which we are looking at today, are among the best performing studio monitoring headphones you can get under $100. There are plenty of reasons why, so let’s jump right in. The success of what Audio Technica did with this line of headphones can’t be attributed to any one thing. They made a several decisions that came together perfectly. Let’s start with the design. One glance at the ATH-M40x will tell you that there is an abundance of padding. Is it necessary? Probably not, but it covers the whole spectrum of user preferences. Next come the ear cups, they are fully adjustable. In other words, you can rotate them however you want and leave them at whichever angle you prefer. This means the headphones can be used for listening to music, mixing a track or doing a live set as a DJ. Last point worth mentioning when it comes to design are aesthetics. Many brands just ignore aesthetics in this price range, but not Audio Technica. ATH-M40x are actually attractive and inspire a feeling of quality as well as refined style. Hardware wise, things are even better. We have two impressive transducers with proper voice coils that come as standard. Frequency response range doesn’t dig as deep as some of its competitors, but that is perfectly fine. In terms of sensitivity, ATH-M40x offer some 98dB of SPL while the nominal impedance is set at 35 Ohms. This allows you to use the headphones on the go should you need to. Audio Technica ships ATH-M40x with two sets of cables, both around 10 feet long. The difference is that one is coiled with a default length of 4 feet. This also tells you that the cables are detachable. Lastly, there’s the padding. Audio Technica didn’t skimp on padding, offering you a very comfortable and long lasting set all around. Ear pads provide for a good seal no matter how you orient the headphones, with a minimal fatigue factor involved. We have covered several factors which make ATH-M40x so impressive. It is time to talk about the most important one. Performance of these headphones is impressive to say the least. Transparency is there and in abundance, which is what initially drew so many users to this platform, We have mentioned that the frequency range doesn’t dig as deep as some other models on the market do. However, it is worth mentioning that ATH-M40x offer a level of definition that is hard to find in this segment. Some of that performance was range was sacrificed for versatility as they wanted ATH-M40x to be usable both in a studio and on the road. In the end, it feels like Audio Technica has discovered a winning formula for budget studio monitoring that is yet to be rendered obsolete. ATH-M40x are just that good. When they first appeared, Audio Technica ATH-M40x almost instantly became the star of the budget segment. All these years later and that hasn’t changed one bit. The market has been catching up, but the reputation established by M Series is still very much alive. These are truly awesome studio headphones. 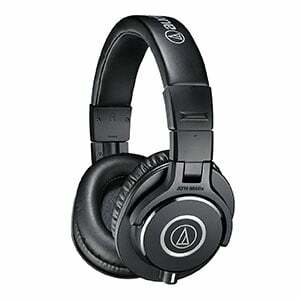 For more info about the Audio-Technica ATH-M40x, click here. For more Studio Headphones Under $100 you might like, click here.